All set! - What's next? Simply connect to your Gusto account, and Expensify will be updated to reflect any changes made in Gusto. The integration takes minutes to set up, is ready out-of-the-box, and will save your HR team hours each month! Provision Expensify accounts for all full-time, active employees as soon as they're hired. Update the approval workflow in Expensify based on any changes in Gusto. Deprovision employees’ Expensify accounts upon their termination date. You'll need to be an admin in both Gusto and in Expensify to set up the integration. You must have a Control or Collect policy in Expensify to integrate with Gusto. If you aren’t already on a Control or Collect policy then no worries, you'll have the opportunity to upgrade during setup. Every employee record in Gusto must have a email address, since that’s how each employee will sign into Expensify. Gusto will add all employees to one Expensify policy. If your company uses multiple Expensify policies, you'll have the option to choose which policy to connect during the setup process. Step 2: Configure the Connection and Save! Basic Approval - Each employee will submit expense reports to one final approver. By default, the final approver is the policy's Billing Owner in Expensify. 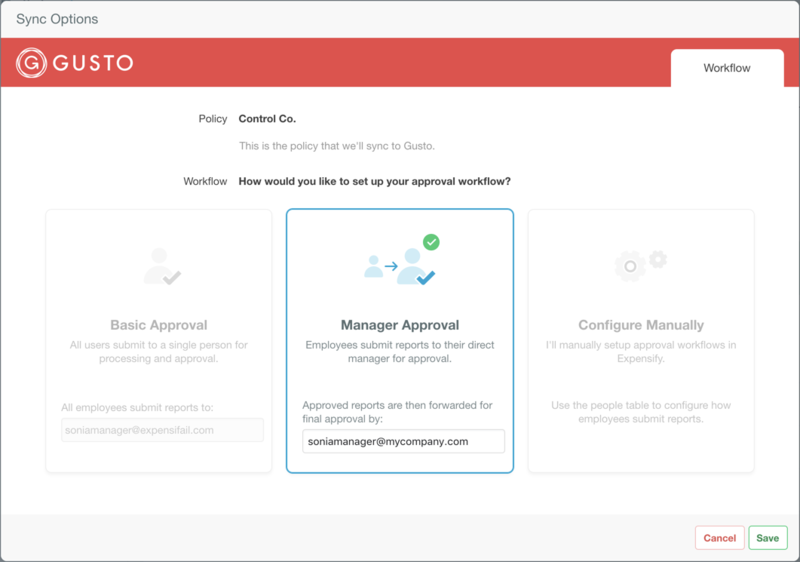 Manager Approval - Expense reports will first be submitted to each employee's direct manager as listed in Gusto, and then forwarded to one final approver. By default, the final approver is the policy's Billing Owner in Expensify. Configure Manually - Use the People table to manually configure how employees submit reports. In this case, you're choosing to not import an employee's manager. You will need to manually set and update the approval workflow for each employee. If your team has a highly complex approval workflow, this option will allow for multi-tiered approval chains. For more information on Advanced Approval, take a look at this help doc. Note: If you're new to Expensify, your setup will include a free Control policy trial with the option to purchase a plan at any point. We'll walk you through setting up your account and the Gusto integration, and you can always check out the Expensify for Admins guide for a great overview of managing your account!! Step 3: What about my employees? Each employee will receive a welcome email at their email address along with a request to validate their account and choose a password. They can also download our mobile app for iOS and Android devices. If employees have questions, they can use our ExpensifyDocs to search for answers, or you can direct them to our Employee Training help page. Fantastic! 🎉 Now we'll import any new employees from Gusto into Expensify, keep track of their approval workflow, and remove them when the time comes! Your policy will automatically sync with Gusto every night to import new, update existing, and remove terminated employees. If you need to update your policy before the nightly sync, you can initiate a sync from Settings > Policies > Group > [Policy Name] > Connections > Gusto > Sync Now. The Expensify accounts are set up with company email addresses while Gusto is populated with personal email addresses, will the accounts still link? In this case you will want to have your users add their email address as listed in Gusto as a Secondary Login to their Expensify account. This way the integration will link their Gusto profile to their Expensify profile based on their Secondary Login. Learn more about Secondary Logins here. I set up the connection and my users received invitations emailed to their personal email addresses which duplicated accounts linked to my company policy. Sounds like your users are set up in Expensify with their company emails but with their personal emails in Gusto. The easiest way to resolve this is to have your users merge their existing Expensify accounts with the new accounts created with their personal email addresses. Learn more about merging accounts here.